After years of declining Altima sales in Canada, Nissan has finally taken the bull by the horns. 2019 sees not only the arrival of the sixth generation of this midsize sedan, but also the addition of all-wheel drive. Finally some Competition for the Subaru Legacy! In the midsize sedan segment, few models offer all-wheel drive. In fact, there is only one: the Subaru Legacy, but it’s going to have some company. The Altima is seeking to steal a few of its buyers away. I know what you’re thinking: doesn’t the Ford Fusion have AWD, too? Well, yes, but since it’s on the verge of being discontinued, let’s put it aside for now. Also: 2019 Nissan Altima: This is It! Unfortunately, this new-generation model was launched in California, which is the worst place to put a four-wheel drive system to the test. We’re looking forward to the first snowfall in Quebec to pit the Altima against the Legacy so that we can draw some more relevant conclusions. The drivetrain couldn’t be any simpler. For the Canadian market, there is just one engine: a 2.5-litre four cylinder that offers 182 horsepower and 178 lb.-ft. of torque. 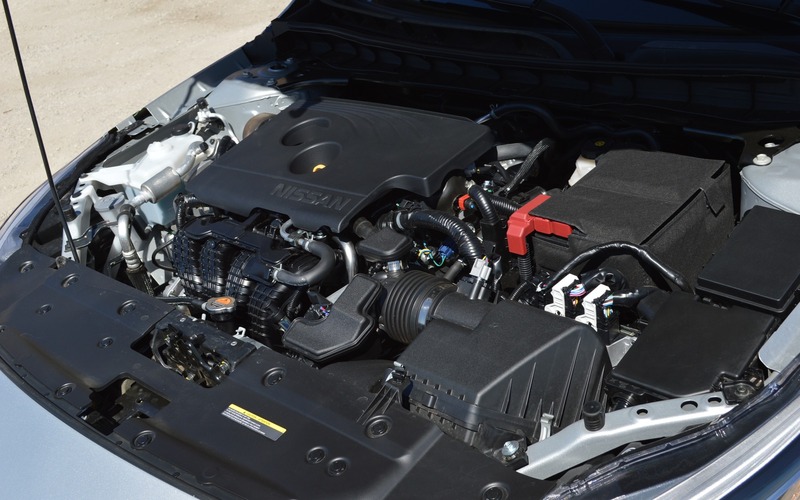 It’s paired with a continuously variable automatic transmission (CVT) that makes the engine noisy—as is often the case, unfortunately—even when it is pushed slightly. The 2019 Nissan Altima won’t be qualified as a speed demon, but being fast is far from its main objective. Even though Nissan probably would have only sold a handful, we’re still disappointed the variable-compression turbocharged engine won’t be crossing the border. We were giddy about its 248 horsepower and 273 lb.-ft. of torque. For comparison’s sake, note that the Legacy’s 2.5-litre engine generates 175 horsepower and 174 lb.-ft. of torque. Natural Resources Canada has yet to publish the new Altima’s fuel consumption figures, but Nissan says its combined highway/city numbers will be 7.9 L/100 km in the S and SV versions. In 2018, the front-wheel-drive Altima posted 7.6 L/100 km. The Legacy’s fuel economy isn’t as good as the Altima’s, coming in at a combined 8.2 L/100 km. While SUVs are more popular than ever (I feel like I write that in all of my test drive reports, regardless of the vehicle category), manufacturers falter when it comes to developing a strategy for their sedans, whose sales numbers are plummeting. A mere $2,000 separates a high-end Altima from an entry-level Maxima. The former has a four-cylinder engine and all-wheel drive, while the latter is equipped with a V6, but you’ll have to live with front-wheel drive. And that’s not all. There’s also the Infiniti Q50, which belongs to the same big family. Starting at less than $40,000, it encroaches on its two cousins’ turf. Is there one too many players on the field? Maybe, and I wouldn’t be the least bit surprised if I found out that the Maxima would be retiring soon. And Why Not a Really Affordable Version? When I say “affordable,” I mean “really affordable.” Nissan tends to compete hard when it comes to pricing. Remember that they offer the least-expensive car (Mirca) and SUV (Kicks) on the market. So why not use a similar offensive for their midsize sedans? While no one would turn their nose up at an all-wheel-drive Altima, it’s not a vehicle that suits everyone’s needs. Want proof? It took more than 25 years for Nissan to wake up and offer it. Given the situation, both the consumer and Nissan would benefit if there was a four-wheel-drive Altima for less than $25,000. The Altima’s trunk capacity of 436 litres is perfectly respectable considering that the Legacy’s is 425 litres. Calling the old Altima bland would be an understatement. And although the 2019 model doesn’t stand out with breathtaking style or transcendent handling, it has an ace up its sleeve in the form of all-wheel drive. It will be interesting to see if this feature is enough to keep the number of Altima owners from dwindling further. 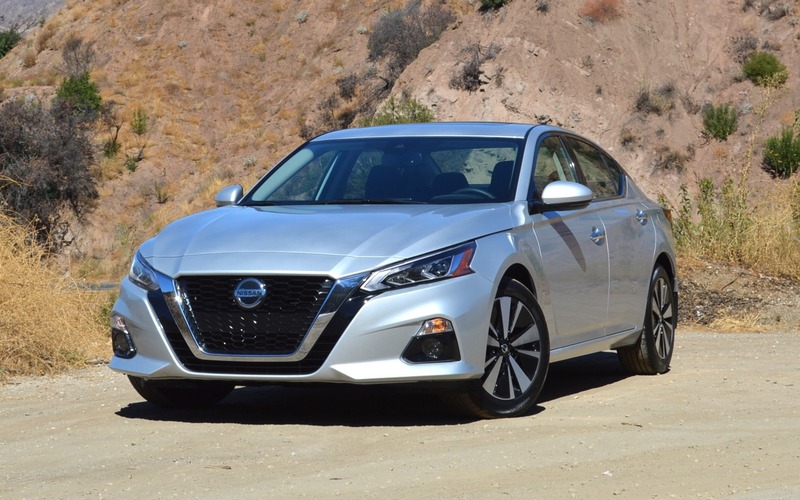 New York 2019 Nissan Altima: This is It!